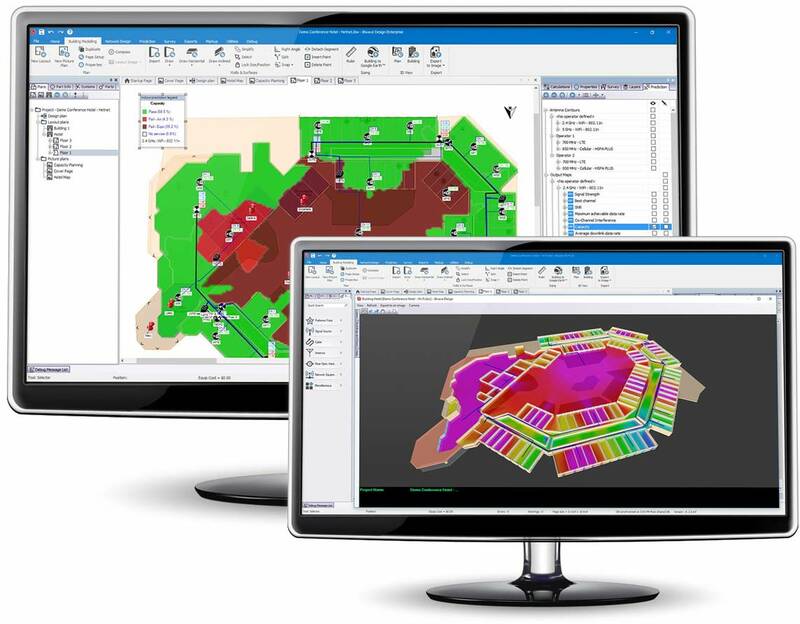 THE MOST PRODUCTIVE AND COLLABORATIVE WAY TO DESIGN HIGH-QUALITY Wi-Fi NETWORKS. With cloud-connectivity, seamless integration with iBwave Wi-Fi® Mobile, active and passive surveys, advanced 3D modeling, smart antenna contouring, a full database of all network parts and powerful prediction capabilities for coverage, throughput and capacity, iBwave Wi-Fi® is the most productive and collaborative way to plan, design and deliver high-performance Wi-Fi networks. The ability to design and visualize Wi-Fi networks in 3-D is a unique iBwave feature that I have come to rely on for access point placement and troubleshooting. 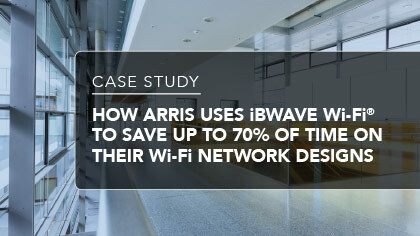 The granularity iBwave provides is exceptional, especially with the new capability to design with multi-radio APs that are unique to Riverbed Xirrus for supporting high density Wi-Fi networks. 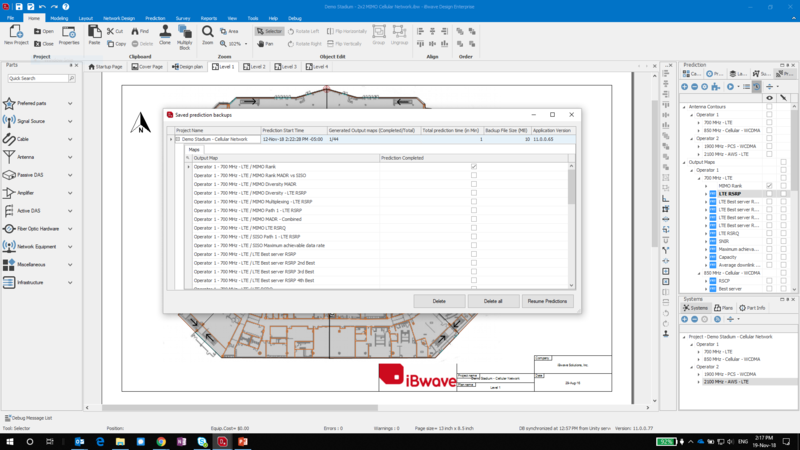 Add to that the mobile tools and the variety of reports you can generate makes iBwave an invaluable tool for Wi-Fi deployment. iBwave's 3D predictive modeling and new smart antenna contouring with fast ray tracing takes Wi-Fi design tools to a whole new level. From a vendor neutral perspective, probably iBwave Wi-Fi (PC Version) is the most advanced solution in the market. With full support to integrate Wi-Fi APs with detailed backhaul cabling , network infrastructures and budgeting, 3D venue modeling and network visualizations, the most advanced RF calculations for prediction accuracy, and cloud integration to simplify the interaction between Wi-Fi architects, project managers and site surveyors. In today's high density Wi-Fi environments, airtime is a precious commodity that is best served by the abundance of available channels in 5 GHz. Access points with dual 5 GHz radios are best suited to meet airtime and capacity needs. A software selectable radio also offers the benefit of 2.4 GHz connectivity when needed. iBwave's multi-radio feature assists any WLAN professional with dual 5 GHz WLAN designs in addition to legacy 2.4/5GHz WLANs designs. 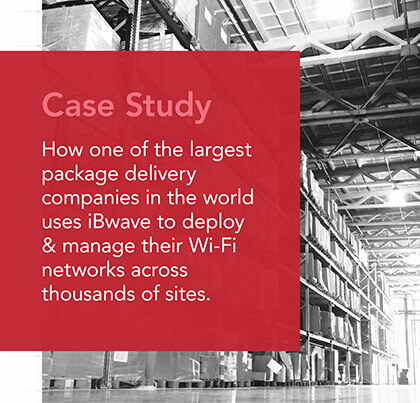 What can iBwave Wi-Fi® do for you? 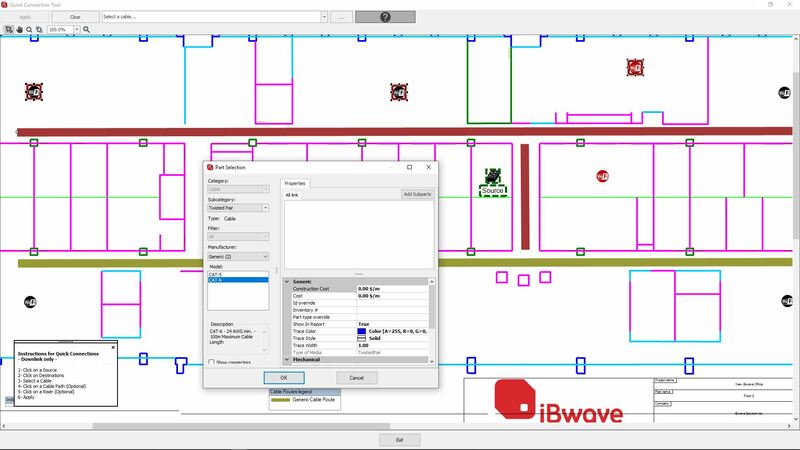 iBwave Wi-Fi® eliminates many of the design process inefficiencies that exist today so you can recognize revenues sooner, grow your project pipeline faster and your customer saves time and money. Active Surveys with an integrated server. Assess a network's performance without using iPerf or another third-party tool. Simply launch the 'Active Survey' server from your desktop and then survey with either the mobile app or PC version. A Complete Bill of Materials. With the ability to design your entire network with APs, cabling and network equipment, you can quickly generate an accurate bill of materials for your customer. Auto-AP Placement and Auto-Channel Assignment. Use the optional AP placement in either the mobile app or PC version to quickly start your Wi‑Fi network design. 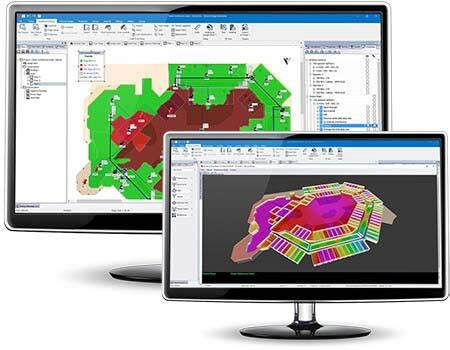 Freely move, delete or add APs around the floor plan to get the design just right. Quickly assign each AP in your design to a channel with the auto-channel assignment functionality - then update channels if/where needed. Smart Antenna Contouring. View live signal strength predictions as you design so you do not have to run full prediction results multiple times. Automatic Cable Routing Alignment. Model cable trays and risers in iBwave Wi‑Fi® Mobile or iBwave Wi‑Fi® and then save hours of time with the automatic cable alignment functionality that automatically snaps them into place. Cloud-connectivity to easily share files. 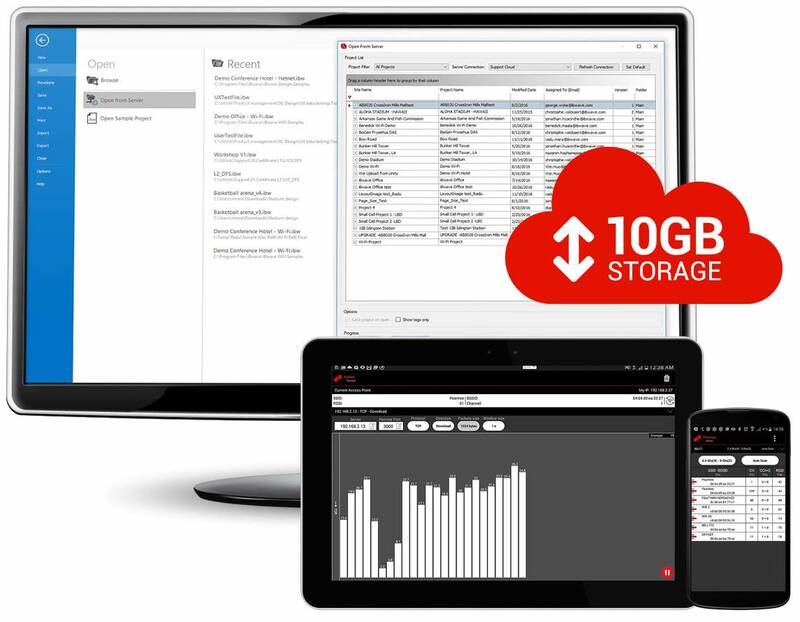 Easily share files with your team and with your customers by using the free 10GB of storage in the iBwave cloud to save and access files from anywhere, anytime. Multi-adapter Passive Survey. Use of several Wi-Fi adapters to collect survey data. Each of them can be configured to scan a certain band, specific channels or groups of channels. Decrease time to collect data when tasks are distributed among the adapters. iBwave Wi-Fi® provides you with a cloud-connected solution that makes it easy for teams and customers to share files and work together. Cloud connectivity. Save your projects to the cloud so you and your team can access your projects from anywhere, anytime. Seamless connectivity with iBwave Wi-Fi® Mobile. Work on your designs from either your tablet or PC knowing your files will always be accessible from both. Share projects with your customers with iBwave Viewer. Send your design to your customers for review via a secure link so they can open it up in iBwave Viewer and provide you with feedback. With the ability to model your venues in 3D and a large database of all Wi-Fi network components, you can impress your customer with a 3D visual of what the network will look like in their venue, and how well it will perform. Components Database of accurately modeled vendor network components. Drop accurately-modeled access points and network equipment (antennas, cables, routers, controllers, switches, miscellaneous). Call us to add parts as you need them or add them yourself. Advanced 3D Modeling. Import floor plans in AutoCAD, PDF or any image file to model your buildings in a CAD-powered modeling engine. Draw walls, floors, horizontal and inclined surfaces. 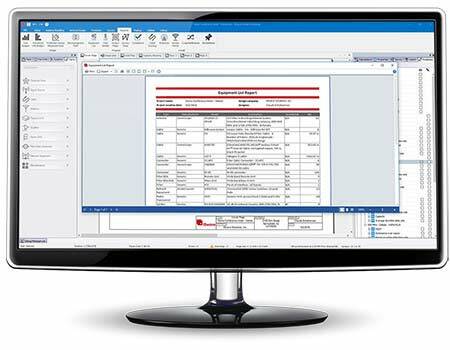 Assign materials from an extensive database of materials - or by adding your own material. View the model in the 3D viewer and watch it come to life. View prediction and design details in 3D. 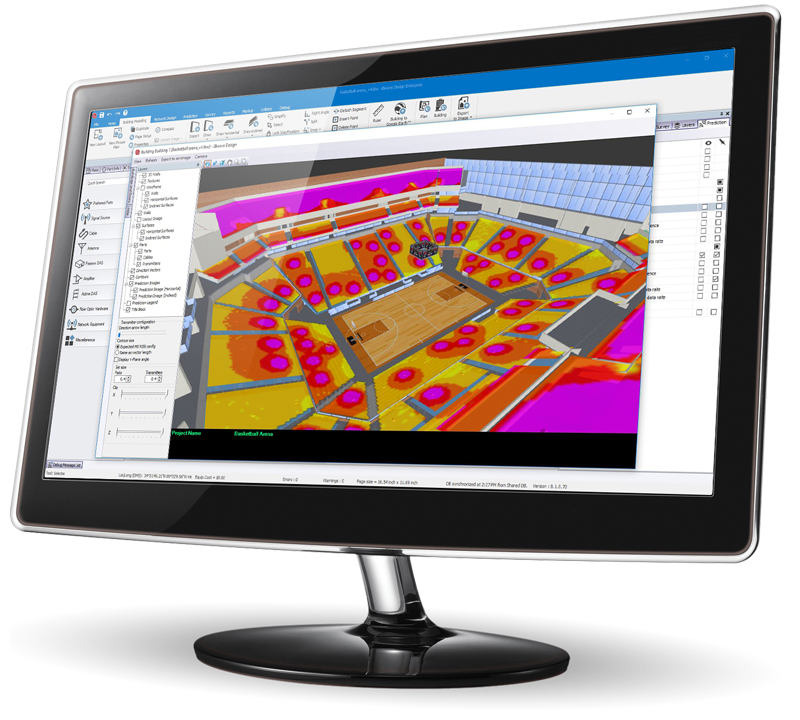 View prediction and the placement of your components from floor-to-floor throughout the venue. See how they connect and show your customer exactly what the network will look like once it is implemented. Adjust 3D view layers. In the 3D modeler, you can adjust all planes of your design (x,y,z) to view your building as a whole or floor by floor. You can also adjust visible layers to choose what you are looking at: cabling, APs, network equipment, prediction). Zoom in, walk through and pan your design and export an image to include in reports or send to your customer. 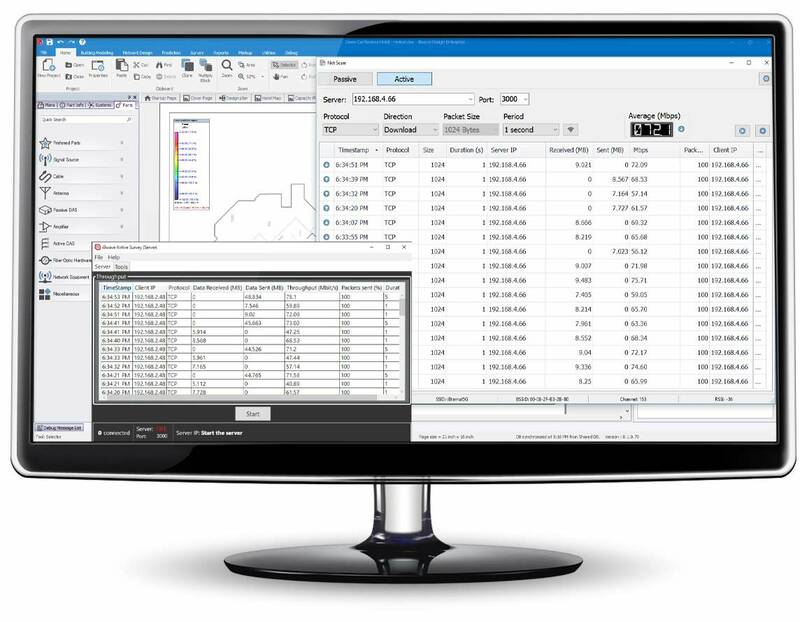 With the iBwave Wi-Fi® advanced propagation and capacity analysis engine you drastically reduce the risk of network re‑design costs post-installation by accurately simulating the performance of your network before it's deployed. Calibrate Prediction Results with Survey Measurements. Calibrate prediction with your survey measurements to increase the accuracy of the network's predicted performance. Calibrate all co-efficients or just material coefficients, and then save the model to apply to similar environments in future projects. Smart Antenna Contouring. View live prediction of an access point's signal strength live on the screen while you are doing the design. Fast Ray Tracing Prediction Engine. Run fast ray tracing prediction to assess how your network and assigned materials will perform once installed. Consider walls, horizontal surfaces and inclined surfaces - either imported and modeled in 3D or drawn manually with built-in modeling tools. VLPE Prediction Engine. Save the time you usually spend on modeling venues by using our patented propagation engine to use density zones instead of walls to capture and model the environment characteristics of a venue. Run this prediction both in the mobile app or PC version. Capacity Analysis Engine. 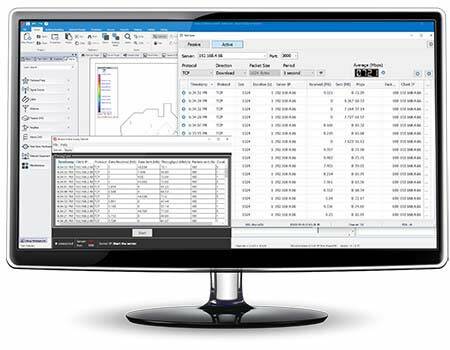 Simulate the traffic usage on your network with the most advanced capacity analysis tool on the market. Define capacity by technology, users, applications and capacity hotspot zones. Output Maps. Assess a network's coverage performance with the RSSI, CCI, Best AP, Best Channel, Overlap Zone and Maximum achievable data rate maps. Then assess the network's capacity performance with the Capacity and Average downlink data rate maps to show the user's network experience. 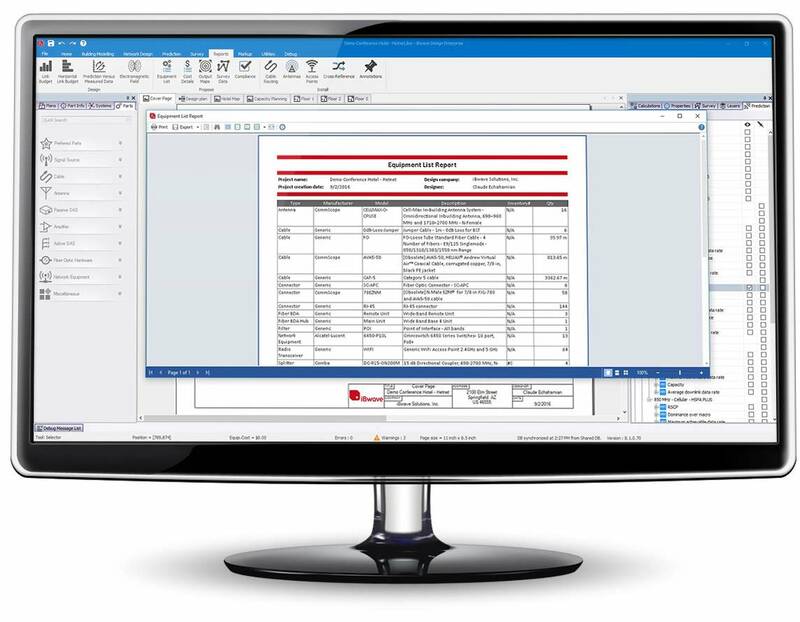 Quickly generate key project reports to distribute to your internal and external stakeholders. iBwave Viewer. Let your customers open design files (read-only), view the design and prediction in 3D and run their own project reports anytime they want. 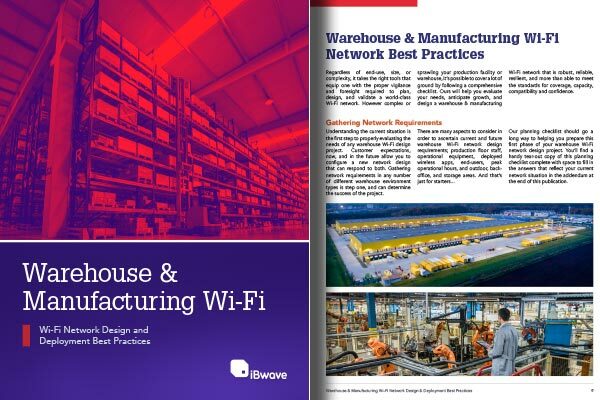 If you've ever designed a Wi-Fi network in a warehouse, you know how challenging it can be. You have to consider the high levels of RF interference, inventory stock effect, and the many different wireless applications and robotics that depend on the network. 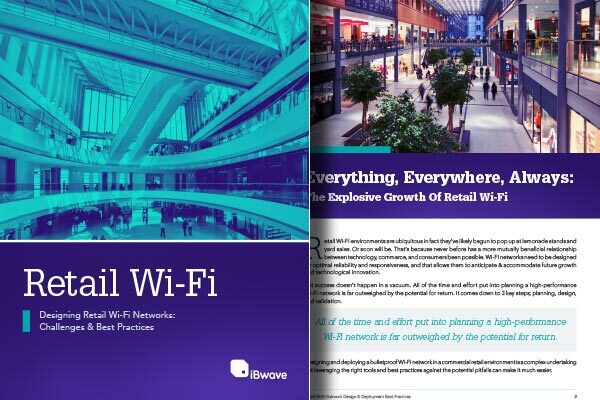 When it comes to designing Wi-Fi networks, retail environments offer their own unique challenges. There are aesthetic considerations to take into account, capacity challenges to overcome for such a high-density space, overall coverage performance, cabling, and much more. Did you know that a stable Wi-Fi connection is more important to a hotel guest than a breakfast of parking? Or that 65% of hotel guests connect to Wi-Fi within seven minutes of arrival? 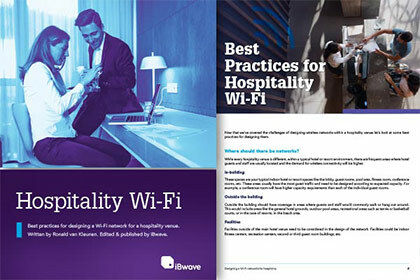 In this eBook, we explore what the different challenges and best practices are of designing a Wi-Fi network for a hospitality venue. Even a wireless guru needs a little reference every now and then. Which is why we've combined a whole bunch of them for you! In this poster, you'll find most of the cheatsheets you might need when designing wireless networks. 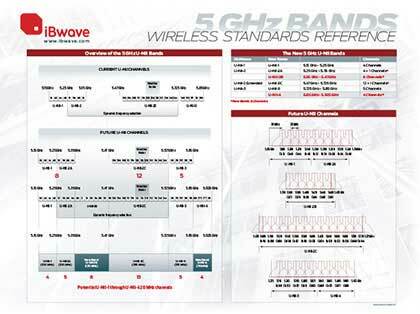 We've included tables with 5 GHz U-NII Bands overview, new 5 GHz U-NII bands, current and future U-NII Channels. Enjoy! In the age of smartphones and tablets, data usage has become so heavy, and use cases so diverse, that Wi-Fi network design requires strategic thinking. 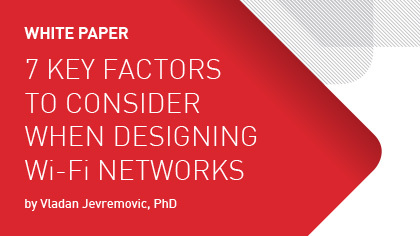 This white paper addresses the following seven Wi-Fi network design topics in detail and outlines best practices for Wi-Fi network design. AP placement, AP coverage control, Dominant use case, Vertical markets, Interference management, Radio-Frequency (RF) band steering and Capacity planning. 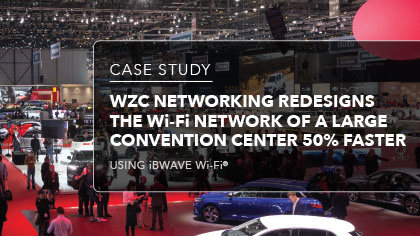 WZC Networking used the powerful combo of the iBwave Wi‑Fi® Mobile app, iBwave Cloud, and iBwave Wi‑Fi® for PC/Laptop to drastically reduce the time it took to do the site survey, design the network, ensure performance KPI compliance, and deliver an accurate and complete Bill of Materials. Here is how they did it. 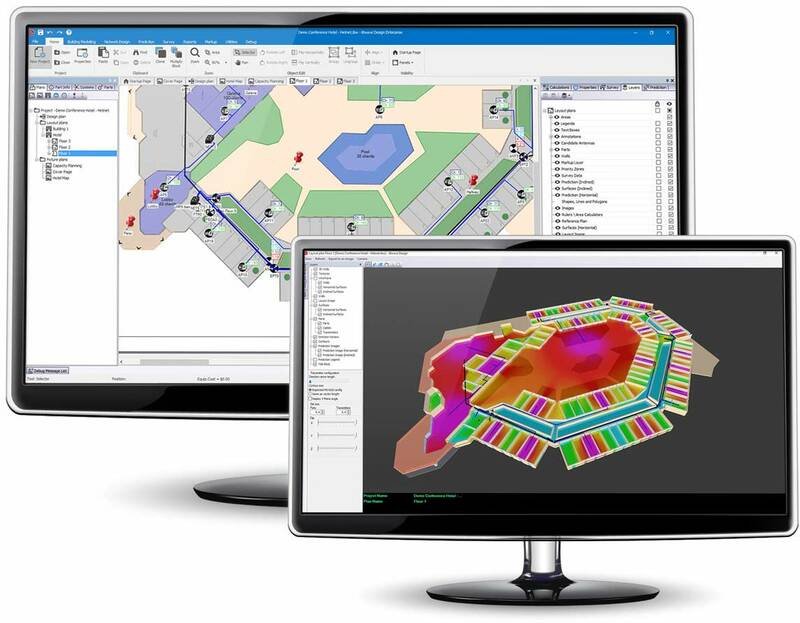 Wi-Fi network design software for your PC. 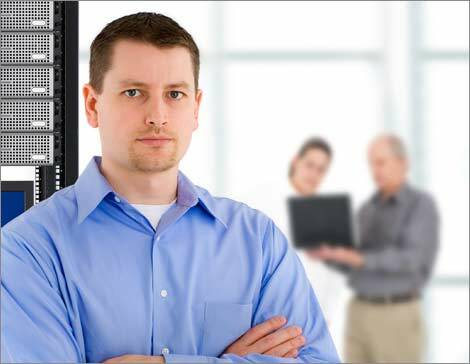 We offer a full list of services such as building and environment modeling, creation and certification of components, and legacy project design conversion to the iBwave format. iBwave's entire product suite is covered by an optional Annual Maintenance Service for full customer support, and access to updates and upgrades on all our products. See up to 50% time savings when running your heatmaps for large and complex projects with a new prediction engine that maximizes the efficiency of your computer's physical memory, drastically reducing the time it takes to run prediction. Risers are now available in iBwave Wi-Fi®. 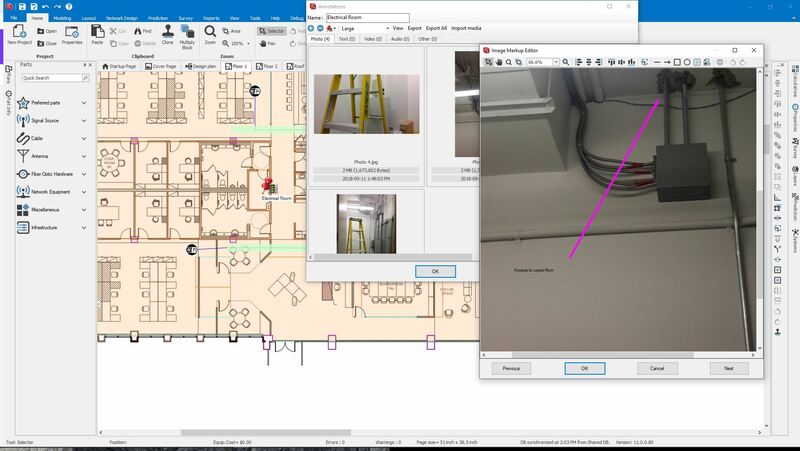 Real-word modeled risers are now available to design with, automatically aligned on your floor plans and capable of having multiple cables routed through the same riser. Select to have a 'condensed annotations' report, that combines the floor plan and the annotations on the same floor. * iBwave Wi-Fi® does not allow the usage of multiple simultaneous Terminal Server sessions. * iBwave Wi-Fi® will not run under multiple simultaneous Terminal Servers.